As a child I had been very very interested in Dinosaurs. Those days there were not many programs on these gargantuan reptiles. 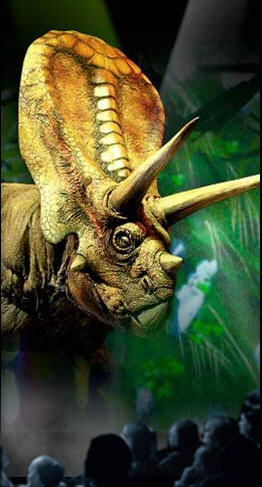 Sometimes some early CGI dino would grace the television thanks to Discovery Channel. Then came Jurassic Park. It was heavenly. The Jurassic Park was the best thing I came across in cinema. Eventually I watched it numerous times. So when I got the opportunity to watch Walking with Dinosaurs it was tryst with childhood. Of course, the awe factor is gone but it still is a great treat. The show traces our good old Earth’s history from the existence of the supercontinent called Pangaea (Pangea) in the Mesozoic era (around 250 million years ago) to the Cenozoic era when mammals arrived on Earth. In less than two hours you get to know about the continental drift, the evolution of flowering vegetation from non-flowering ones, the turbulent climatic changes and of course the 200 million year story of the evolution, dominance and ultimately the demise of the dinosaurs. 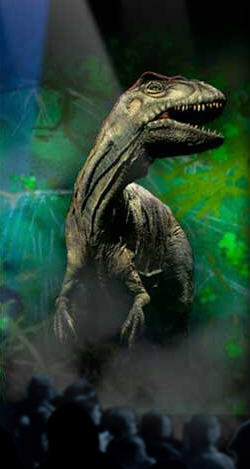 It starts with Plateosaurus and the Allosaurus followed by the Brachiosauraus and Torosaurus. They are introduced according the timeline in which they existed. The Pangaea is represented by a raised pyramidal structure in middle of the stage area. It the breakes up and shifts as the timeline proceeds. The other dinos are the Utahraptors (agile and carnivorous), the armored Stegosaurus, the flying Ornithocheirus, the completely armored Ankylosaurus and last of all, what one can easily call the King of Dinos, Tyrannosaurus Rex. The life sized dinos saunter in, send out loud cries, the big ones bend towards the audience and have some eye to eye moments, nibble at the bright flora around the stage area, even poops. 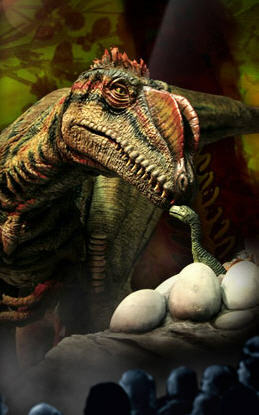 They prey on other dinos, fight amongst themselves, protect their young ones – all included in the scope of the show. All the while, the host, a paleontologist named Huxley (played by is on stage talking about the reptiles, their home terrain, climate etc. The T-Rex comes in last – like a popular celebrity. The T-Rex is greeted with loud clapping and enthusiasm from the young audience. It has the loudest and most powerful cry of all the presented dinos. The show ends with the annihilation of the dinosaurs by the turbulent climatic changes caused by the earth being hit by comets (good light affects) and volcanic eruptions. The dinosaurs are beautiful with very realistic blinking eyes, moving mouths and moving legs. However the legs just move, the dinos are actually propped up from a wheeled structure that looks like a formula one car. But you soon get used to it. The smaller dinos are humans wearing the dino costume. These are essentially operated by puppeteers and drivers. The lighting and special affects are good. It is a show dino enthusiasts would like and children would love. If you are not a dino enthusiast you might not enjoy it. You would see it as a fashion show of dinos where they come on to stage, strut around and leave. Really young toddlers might find some portions a little scary but with the right guidance by parents they would love it. And yes there’s the dino merchandise to entice the young ones too. It is also informative. Though the narration is educational, it is not boring as any educative narration would be! Wish List – They could have done more – for instance when the flying Ornithocheirus comes, it is shown in flight only on stage. It would have been great to have it fly over the audience. And instead of being suspended by wire or whatever, it could have been remote controlled. It would have been ultimate. It would be totally thrilling to have the dinos free walking ! But again, no complaints. It is worth a visit – especially for children. In New York City, the show was held at Madison Square Garden. Only three fourth of The Garden is taken. 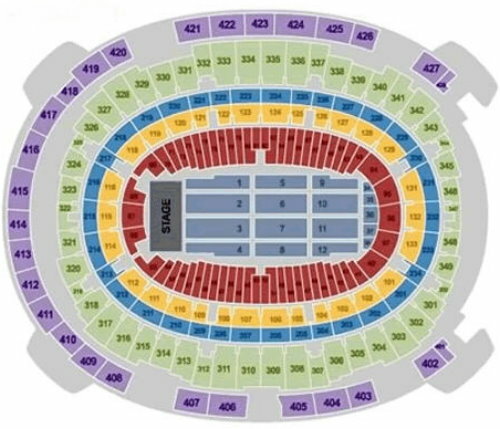 The stage screen cuts across around sections 76,121 to 59, 109 (approximately). Sections 40 to 94 and the corresponding sections behind give the best view for Walking with Dinosaurs. The show is by the aptly named Creature Production Company. It was produced by Malcolm Cooke and Jill Bryant and directed by Scott Faris. It is a $20 million dollar arena spectacle and has had 10 successful weeks in Australia where it was originally created. It is touring North America now. This is inspired by the 1999 award winning 6 part television series by BBC, “Walking with Dinosaurs”. At the time, the series was the most expensive documentary series per minute ever made as per the Guinness Book of World Records.